OAKLAND, Calif. (AP) Even after his Golden State Warriors scored 42 points in the third quarter, coach Steve Kerr was most pleased with their defense. 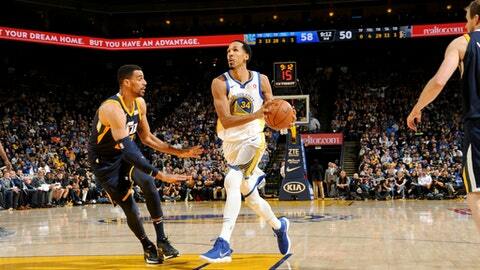 Kevin Durant scored 21 points, Draymond Green flirted with his second straight triple-double and the Warriors used that big third quarter to zoom past the Utah Jazz, 126-101 on Wednesday night for their 13th win in 14 games. The game was the 10th straight the defending NBA champs played without two-time MVP Stephen Curry, sidelined by a sprained right ankle. The team redefined itself, Kerr said, and won nine of them. ”I love what we’ve become, morphing into this defensive juggernaut,” he said. Durant, who blocked three shots and has swatted at least two in 10 straight games, said the team knew life would be different without Curry. But the Warriors held teams to an average of 95.2 points during the stretch. ”Defensively is where we kind of knuckled down because we knew offense was going to be a little tougher,” Durant said. Durant also said he expects Curry to be back soon. He is scheduled to scrimmage 5-on-5 on Thursday and will be evaluated Friday before the Warriors’ game against Charlotte. ”I see the look in his eyes and I know he’s ready to play,” Durant said. Green finished with 14 points, eight rebounds and eight assists in three quarters, two nights after tying the franchise career record with his 20th triple-double. Patrick McCaw added 18 points. Jazz coach Quin Snyder wasn’t surprised by the way Golden State came out after halftime. The Warriors’ 42-22 margin in the quarter marked the fifth time this season they have outscored an opponent by at least 20 points in the third period. Jazz: C Rudy Gobert (left PCL strain and bone bruise) missed his seventh straight game. ”They’re different because Gobert’s out,” Kerr said. ”That changes everything.” . G Raul Neto (concussion) was sidelined for the ninth straight game . Rookie Nazareth Mitrou-Long received nine stitches above his left eye Tuesday night after a late-game collision with the Nuggets’ Trey Lyles. He did not play Wednesday. Warriors: Klay Thompson was 3 of 5 on 3-pointers, moving him into a tie for third with Dana Barros at 89 consecutive games with a 3-pointer. Curry has the NBA record of 157 games . Durant has averaged 29.0 points, 8.6 rebounds, 5.4 assists and 3.1 blocked shots in the 10 games the Warriors played without Curry . Center Zaza Pachulia, who missed eight games with shoulder soreness, started for the first time since Dec. 6.